Tripura royal scion Pradyot Kishore Manikya Debbarma on Sunday joined a huge protest rally against the controversial Citizenship Bill at Baijalbari in Khowai district of Tripura. Debbarma launched an attack against the BJP over Citizenship (Amendment) Bill, 2018 saying the legislation is a “jumla”. The royal scion also threatened that if the National Democratic Alliance (NDA) government tries to pass the Bill in Rajya Sabha or enforce it through an ordinance, it will have consequences of massive protest, say media reports. The protest rally was taken out in the afternoon at Baijalbari in Khowai district, 55 km from Agartala. It may be mentioned that at least five persons were injured, with two sustaining bullet injuries, during a clash between policemen and North East Students’ Organization (NESO) supporters at Khumulwng, headquarters of the Tripura Tribal Areas Autonomous District Council (TTAADC), nearly 25 Km from Agartala, recently. The injured activists staged protest against the Citizenship (Amendment) Bill, 2016. Debbarma, who is also the working president of the Tripura Pradesh Congress Committee (TPCC), ahead of the rally, appealed to the people to join the rally. 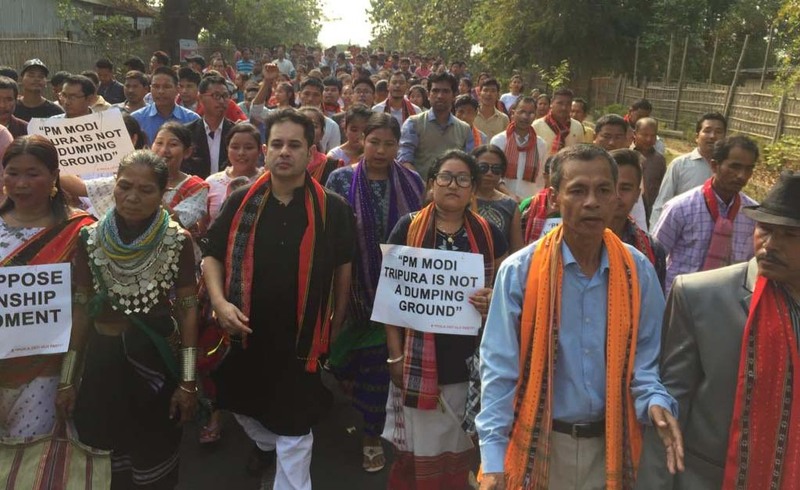 The protestors shouted slogans against the Citizenship Bill holding placards which read as ‘PM Modi, Tripura is not a dumping ground’, ‘We oppose Citizenship Amendment Bill’. The Bill, which was passed in Lok Sabha on January 8, 2019, is yet to get Rajya Sabha nod. The BJP-led NDA government is likely to introduce the Bill in the next session starting from January 31. The Tripura United Indigenous People’s Council (TUIPC), a joint body of 48 organisations, including former insurgent groups, organised the protest rally as a part of the series of agitations against the Citizenship (Amendment) Bill, 2016. Royal scion Debbarma appealed to the people of the state to rise against the legislation. He also reportedly said the BJP’s own ally Shiv Sena is speaking against the Bill and West Bengal chief minister Mamata Banerjee has been protesting in her state.